This is a single person puzzle game that has some of the elements of Lemmings about it. 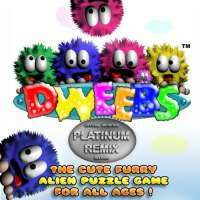 The backstory to this games sees the Dweebs, (small, furry, cute, edible and not too smart) being transported to some alien planet as a delicacy when the cargo vessel crashes here on Earth. The Dweebs survive unharmed but need help to escape from their captors. This is where the player enters the story. The objective of the game is to guide the Dweebs to safety. There are ten zones and each zone consists of a series of timed puzzles. The Dweebs are coloured and are continually on the move. Whenever they walk into an object, the edge of the screen, or each other, they reverse direction and keep on walking. It is the player's job to direct each Dweeb to an exit point of the correct colour. This is done by placing directional arrows in the Dweeb's path, once they cross the arrow they will change their direction to match that of the arrow. The game can be played entirely with the mouse or with the keyboard. Through the game's Options menu the player can change the difficulty level, the speed at which the Dweeb's move, and enter a password to start/restart at a specific zone.